Ghee Butter: Is It Actually Heart-Healthy and Lactose-Free? Ghee butter, also known as clarified butter, is the latest food trend, especially for the lactose-free community. Some celebrities like Kourtney Kardashian heavily endorse Ghee for this and its health benefits. However, looking at its origins as well as recent research leads people to question Ghee’s magical powers. Ghee started in India for several different cultural purposes. For example, Indians used Ghee for medicine, food, and spiritual/religious practices. They did and still do believe that it has cleansing powers, especially in the Hindu religion. In order to make Ghee, they turn milk into butter and then put it through a process of separation. Heating up the butter gets rid of any milk solids and excess water or foam. This clarifies the butter, making it one entity that looks clear and smooth like the photo above. The best part about Ghee is its incredibly long shelf life. Since the Indians removed the excess ingredients in butter, they did not have to worry about the Ghee spoiling for a couple of months. 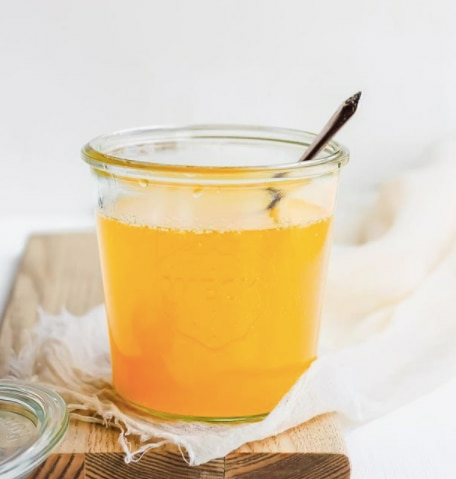 Ghee’s long-lasting characteristic still exists today and has to do with its lack of lactose. This concept shows up again in-depth towards the end of the article. The simple answer is that the medical field is unsure. Ghee butter is made up of fat, which isn’t something you should eat a lot of regardless of how healthy people say it is. Specifically, this fat is made up of both saturated fatty acids (SFA) and monounsaturated fatty acids (MUFAs). These components usually contribute to high cholesterol, which would not make this product heart-healthy. However, interestingly enough, ARYA Atherosclerosis’ studies show that Ghee lowers LDL (low-density lipoprotein) and increases HDL (high-density lipoprotein) levels. LDL is the bad type of cholesterol that builds up in your arteries. 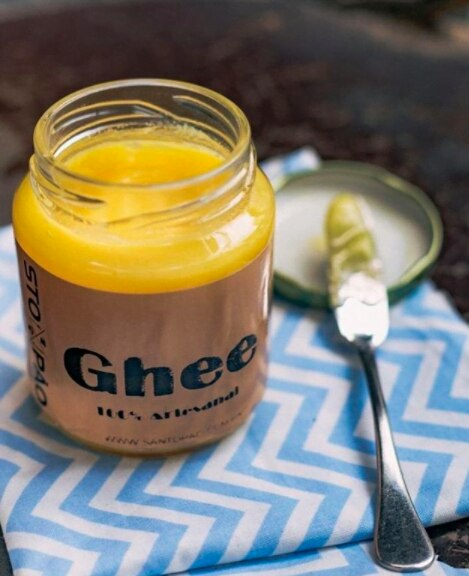 So, according to this study, Ghee lowers the type of cholesterol you don’t want in your body. Additionally, studies show that it increases the good type of cholesterol (HDL) that does not put your body at risk for diseases. There is other evidence, though, that shows Ghee butter raising overall cholesterol while failing to lower LDL levels enough for it to be significant. Researchers claim that there needs to be more information about this product before they recommend it as a heart-healthy substitute for other fats. The answer lies on the labels of Ghee butter in the supermarket; yes, it is lactose-free. This is because of the separation process that butter must go through to become Ghee butter. Lactose is the main sugar found in milk, but a lot of people do not have enough lactase (an enzyme) in their body to digest this part of dairy products. This is what makes people lactose intolerant, or even dairy-free. However, heating butter burns off any lactose and water, making it Ghee as well as completely lactose-free. Lactose-free products often last longer on the shelf and in the refrigerator than regular dairy products because of the lactose. Sometimes this sugar can make things like milk spoil faster. This makes sense because Ghee can last a long time on the shelf or in the fridge, which has something to do with the fact that it is also lactose-free. Overall, to use Ghee or not to use Ghee? Based on research, it doesn’t seem like you should be dropping everything to add Ghee to all of your meals. Sorry, Kourtney Kardashian, but it is not necessarily healthier than butter or other fats like oils. More research needs to be done for this to be proven. If you are simply looking to mix up your butter flavor, then this could be a great alternative. It has a slightly nuttier flavor, and will not hurt you any more than regular butter. Additionally, if you are lactose-free, Ghee butter is a great substitute for regular butter and dairy-based fats. It cannot be said to be any healthier than real dairy, but it will not bother lactose-free stomachs. It is up to you as to whether you want to use Ghee or not, but don’t think it is guaranteed to help you lose weight or lower cholesterol.